Harmon Killebrew was the Minnesota Twins’ first and most enduring superstar, playing 14 thunderous seasons and then continuing his role as the face of the franchise after becoming its first Hall of Fame inductee in 1984. 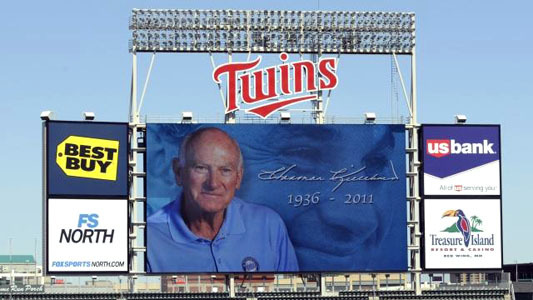 “No individual ha sever meant more to the Minnesota Twins organization…than Harmon Killebrew,” said Twins President Dave St. Peter, who credited “The Killer” with helping to lay the foundation for the long-term success of the Twins franchise. So it is only fitting that so many past- and present Twins players were on-hand for his funeral in Peoria, AZ. In a fortunate twist of fate, the Minnesota team was in Arizona to begin a three-game interleague series against the Diamondbacks on Friday night, so the entire squad was on hand. Current Twins Joe Nathan, Michael Cuddyer and Justin Morneau, as well as manager Ron Gardenhire, were pallbearers, along with ex-Twin Paul Molitor and Killebrew's former teammates Rod Carew, Tony Oliva and Frank Quilici. Hall of Famers Robin Yount and Frank Robinson also attended the service. "Harmon's philosophy was so simple and clear and he wanted to make it clear to us," son-in-law Craig Bair said. "Always give more than you take. Always maintain an even calmness that you might calm others. Truly know that you are loved beyond measure and go out and share that love. Find a place of peace with your partner. Experience daily the love of your family. Enjoy your friends. Know your neighbors and especially go out of your way to do the same to the people new in your life.' 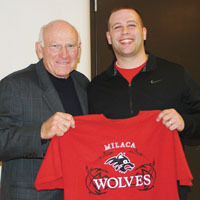 "
• There wasn’t a draft of high school/college players when Killebrew finished high school. Out of the 16 teams in the league at the time, 15 had their scouts talk to him. The Red Sox didn’t scout him but they did make him an offer. • Killebrew played his first Major League game at second base. He had two singles and a double. • Killebrew met seven U.S. Presidents during his career. In June of 1959 while playing for the Senators, President Dwight D. Eisenhower asked him to autograph a baseball. He did and then had the President sign one for him. Eisenhower’s son David still has the baseball. • Killebrew once asked Japanese home run hitter Sadaharu Oh what his secret was for hitting over 800 home runs. Oh said, “Eat, drink, sleep, practice.” When Oh would go hitless in a game he’d take his bat and take 1,000 practice swings. • Killebrew, who received a $120,000 contract from Calvin Griffith after leading the AL in home runs and RBIs following his MVP 1969 season, said “I’m not envious of today’s player salaries because I know that I played during baseball’s Golden Age.” That remark drew a loud applause. • “I knew how many homers I hit in the majors, but once I added up my walks and strikeouts and determined I’d spent about six years of my career doing absolutely nothing,” Killebrew said with a grin.